“Severity for Suffragettes,” Dublin 1912 | Come Here To Me! 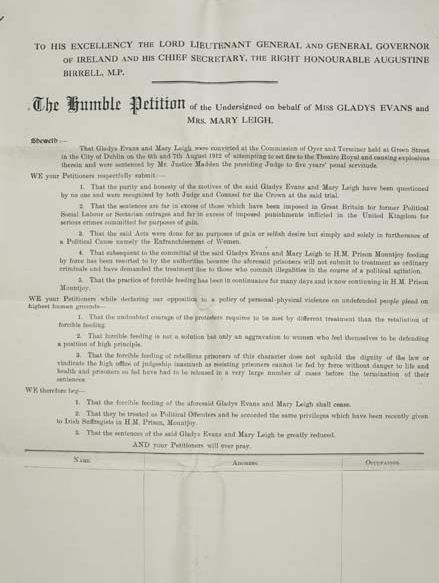 Evans went on hunger strike upon her arrival at Mountjoy Jail and was force-fed for fifty eight days until her release on October 23rd 1912 due to ill-health. Another dubious first, she was, along with Mary Leigh, the first suffragette in Ireland to be force-fed as no Irish suffragette had been force fed up to this point. (“Brown, Susan, Patricia Clements, and Isobel Grundy, eds. Orlando: Women’s Writing in the British Isles from the Beginnings to the Present. Cambridge: Cambridge University Press Online, 2006- .) According to a niece of Gladys in a post on a genealogy website, Gladys eventually went on to drive a supply truck in World War I and then went as a chauffeur to a relief mission in Blerancourt Chateau, Aisne France near the Belgian Border. Mary Leigh, born Mary Brown in 1885 was a school teacher until her marriage. A long serving activist within the movement, she is credited with being responsible for the first act of physical militancy a suffragette when she was arrested for throwing stones at the windows of 10 Downing Street after witnessing acts of police brutality at a suffragette march. (The Women’s Suffrage Movement: A Reference Guide, 1866-1928. By Elizabeth Crawford. Pg 338.) She was responsible for throwing the hatchet at Asquith, missing and hitting Redmond. She initially evaded arrest, but was caught along with Evans and the others in the incident at the Theatre Royal, where she faced the same charges as Evans, having thrown the burning chair into the orchestra pit. She represented herself in court, and spoke so well as to illicit doubt as to whether she could be held responsible for the fire in the Theatre. She was however, found guilty of throwing the hatchet and was sentenced to five years penal servitude. Upon her imprisonment, she went on hunger strike and was force-fed for forty-six days until her release on September 21st 1912. 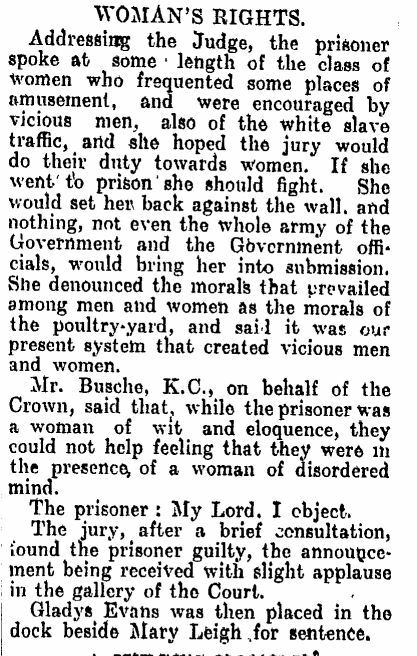 She was re-arrested shortly after her release, and an attempted retrial was held. This was ultimately thrown out, with several references in the court report to her “fiery nature.” Putting her services forward upon the outbreak of World War I, she was turned down for being a “troublemaker.” She reverted to her maiden name and on re-applying, was successful, going on to train as an ambulance driver. Jennie Baines (“Lizzie Baker,”) was another long time suffragette, and a volunteer in the Salvation Army. An early member of the Women’s Social and Political Union, she was a notably powerful speaker, and well respected in the movement for placing more of an emphasis on action over words. She had not been seen near the Theatre, and so, any blame for the fire could not be directly apportioned to her. She had, along with Mable Capper, come over with the other two, and lodged with them in a room on Mount Street in which was found flammable liquid and rubber gloves. She pleaded guilty to a minor offence of causing damage to property and was given seven months hard labour. Like the others, she went on hunger strike, but in her case, the prison doctor feared that force feeding may have had serious implications for her health. As such, she was freed after a matter of days. In her later life, she moved to Melbourne, Australia and achieved the status of a children’s court magistrate there. Mabel Capper was born into a house driven by political activity. Her father was the Secretary of the Manchester branch of the Men’s League for Women’s Suffrage while her mother was an active member of the Women’s Social & Political Union. 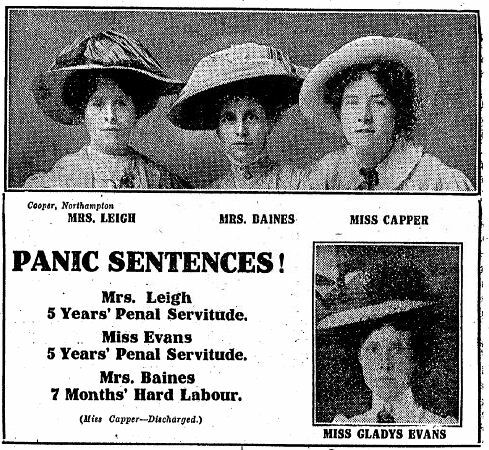 She was imprisoned over half a dozen times for activities relating to the Suffragette movement. Although accused of being Gladys Evans’ accomplice, prosecution entered a “non prosequi” in her case, and charges withdrawn due to lack of evidence. Like the others, she adhered to Christabel Pankhurst’s call for the WSPU’s call to abandon it’s campaign in order to support Britain in WWI and joined the Volunteer Aid Detachment. Entry at http://www.familytreemaker.genealogy.com, provided by Gladys’ niece, Joan Skinner. on August 11, 2013 at 10:57 am | Reply Trouble at the Theatre Royal, 1822. | Come here to me!